The ACX Advanced is a pluggable intelligent controller module providing monitoring and control for Aspiro and Guardian DC Power Systems including full battery monitoring. The ACX Advanced intelligent controller module monitors all system parameters including: DC voltage, rectifier current, rectifier temperature, system capacity, battery parameters, and circuit breaker status. Alarm and warning notifications are indicated by front panel LEDs, and through potential free alarm contacts that allow remote signaling. External monitoring of alarms and the system is accomplished through a USB or RS232 port using PC-based PowCom™ software. The ACX Advanced has an Ethernet port allowing control over a TCP/IP network and web based support. Alarms can be mapped via SNMP traps to customer OSS (Operation Support System) platforms such as Castle Rock Computing SNMPc Network Manager™. To meet individual site requirements, the ACX Advanced intelligent controller module contains a Programmable Logic Units that can be used to monitor and control specified requirements. This allows individual alarm routing and logic operations to be set as actions, alarms to be triggered and outputs to be activated, based on internal or external signal monitoring, comparing and processing. The ACX Advanced controller supports a rectifier 4×64 multiplexer board which adds support for an additional 192 rectifiers by multiplexing four RS485 channels into the single channel provided by the controller. When the rectifier multiplexer is installed with the controller’s internal menu structure is automatically modified so that it displays the 4 channels one of which can be selected to view data about the associated rectifiers. Similarly, when the controller is interrogated using the PowCom™ remote access software channel selection is automatically enabled in the software. 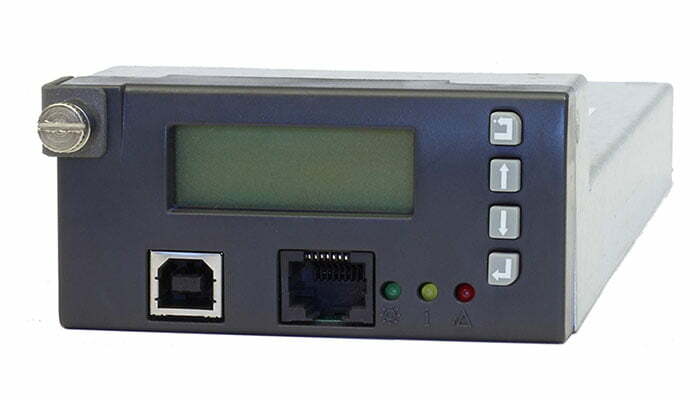 External Communication USB or RS232* interface for remote control via modem or directly from a PC with PowCom™ software. Ethernet port allowing monitoring and control over a TCP/IP network. Web browser support + SNMPv1,v2,v3.